This chapter focuses on the intersection of AET tradeoff preferences (i.e., local environmental versus global warming considerations), political orientations, climate change beliefs, and political efficacy. 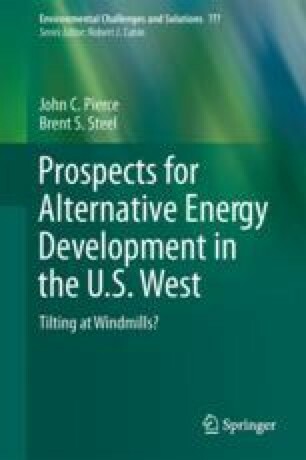 The chapter will begin with a discussion of the role of political orientations in shaping views about climate change and climate change science—in particular, the claims of some that opposition to AET as a replacement for reduced carbon-based fuel use is a political position and not one associated with environmental attitudes themselves. This chapter’s findings suggest that indeed political orientations—more specifically liberal/conservative political ideology--are an important predictor of AET tradeoffs, but fail to erase the impact of the New Ecological Paradigm. Carswell, C. (2012, May 30). The ideological war against renewable energy. High Country News. https://www.hcn.org/blogs/goat/the-ideological-war-against-renewable-energy. Accessed 15 Aug 2016. Dokoupil, T. (2016, January 12). Obama goes big on climate change. MSNBC. http://www.msnbc.com/msnbc/obama-goes-big-climate-change. Accessed 15 Aug 2016. Elliott, D.E. (2013). Why the United States does not have a renewable energy policy. Washington, DC: Environmental Law Institute. http://www.eli.org. Accessed 15 Aug 2016. Foran, C. (2015, December 9). Ted Cruz turns up the heat on climate change. The Atlantic. http://www.theatlantic.com/politics/archive/2015/12/ted-cruz -takes-a-stand-against-science/419691/. Accessed 15 Aug 2016. Kiley, J. (2015, June 16). Ideological divide over global warming as wide as ever. Pew Research Center. http://www.pewresearch.org/fact-tank/2015/06/16/ideological-divide-over-global-warming-as-wide-as-ever/. Accessed 15 Aug 2016. U.S. Senate (2012, May 21). Battle over military green energy efforts heads to Senate. http://www.epw.senate.gov/public/index.cfm/in-the-news?ID=6F8C98CA-802A-23 AD-43B0-1470F5B40DE9. Accessed 15 Aug 2016.